Note: This article is a follow-up to this article from 2012-03-29. Thanks to everyone who commented and sent emails over the past 2 or 3 weeks. I literally received hundreds of emails! I'm trying to reply to all of them, so if you're still waiting for a response, please be patient! I'd especially like to thank everyone who completed the survey about the FREE ebook! A step-by-step guide on how to learn a language naturally on your own! Please read more for the full ebook description and to sign up to get your copy when it's finished! I personally studied several languages for many years and failed to learn more than how to pass a grammar test. It wasn't until I tried a new method, based on how the brain actually learns language, that I was finally able to achieve success learning Polish. I've described this method several times in articles and videos. But always in a very general way. Natural Language Learning will give you step-by-step instructions on how to use my method, with tips on how to modify it for your needs. Traditional methods focus on consciously memorizing grammar rules. You must understand the rules, explain the rules, and then take tests to prove you know the rules. If you're a good student, you can usually learn them and do well in the course. When you're speaking your native language, you aren't thinking about grammar rules, declinations, conjugations, verbs, nouns, genders, tenses, etc. You simply think a thought and your brain is able to unconsciously assemble a grammatically correct sentence. Or, you hear a sentence and immediately understand the meaning. When you truly acquire a foreign language, your brain will process that new language in the same way! Photo (and brain!) by Emilio Garcia. The human brain is designed to learn languages. This is why talent is unnecessary! Linguists talk about a Language Acquisition Device (LAD) that exists in all of our minds. If you can activate this device, your brain will start to learn the language naturally and unconsciously. So, the question is: How do you activate it? It's actually very simple! According to linguists, you activate your Language Acquisition Device (LAD) by listening to (or reading) content in the language that you can understand. Linguists call this comprehensible input. You are in a low-stress environment. Everyone learns languages this way, whether they realize it or not. Even someone who successfully learned a language in a traditional course! But it isn't the memorization of grammar rules that led to their success - it's the comprehensible input. The main problem with traditional courses is that 90% of the time is spent on activities that don't activate your LAD (like grammar and tests). Traditional courses also tend to focus on mistakes and correction - which leads to greater stress. And, of course, the learning materials tend to be very boring and artificial. That's why they usually work very slowly or not at all! Even though the formula is very simple, there is one big problem: How can you understand input in a language that you don't speak yet? This is where having a method is helpful! But all of those parts can be customized to your interests and personal preferences! In short, you can accomplish more, faster and more conveniently, with self-study. And if you need to consult an expert, there are lots of internet communities where you can ask for help (or socialize!) - like Bibliobird! What will be in Natural Language Learning? This will be based on my experience learning Polish in this way - but not only! I've also talked with many other people who have tried my method or similar methods. 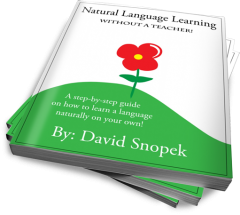 I will try to include several variations, so that after reading this ebook, you will be able to create your own method to learn any language effectively! Do you want this? Let me know! Like I said last time, I only want to create something that you actually want! Even a short ebook will be a lot of work to write. If I spend a lot of time making it and nobody wants it, I will feel like an idiot! While I know from the last survey that a large number of people are interested in some ebook from me, they were all interested in different ideas. If you and enough other people want it (I'm thinking around 300), then I'll write the ebook! Please let me know if you are interested by filling out the NEW survey! If you have any other comments, please write them below! Comprehensive post! Great stuff and a good read and one I hope all language learners will stop by and read. Thanks, Aaron! I actually felt like this post left a lot out - but it was already getting long and I didn't want it to turn into the ebook itself. ;-) I'm looking forward to trying out a longer format medium. Hey, I’ve finally figured out how to translate LAD into Polish and it sounds good: Language Acquisition Device → Ośrodek Akwizycji Języka. Ah, awesome, thanks! You don't happen to know a good way to translate "Comprehensible Input"? :-) I'm not crazy about anything I've come up with and just tend to use the term in English. Yup, I would translate it into „zrozumiała treść”. Input has many meanings, depending on context, and because ‘listening’ and ‘reading’ can be subsumed into one general term – ‘content’, „treść” isn’t so bad. Actually to keep ebook content clear (if Polish version is planned of course), I would vote for using officially recognised terms in science world to not make reader confused in further reading. So, according to http://pl.wikipedia.org/wiki/Hipoteza_Okresu_Krytycznego , "Language Acquisition Device" could be translated to "Mechanizm Przyswajania Języka"
Yeah, a Polish version is planned and I would love to use standard terms - I just need to know where to get the terms from. :-) It would be nice if the terms made sense on their own, but I'm going to be defining them anyway. David, it's nice that you want to write Polish version :-) I believe you could create some wiki page on your blog where community could help you in some ugly cases. I don't think we have a good equivalent of "comprehensible input" in Polish. I've just realized I've been using this term for many years but never thought about its Polish translation. So I searched the Internet and found "ekspozycja znacząca". I don't know whether it's an "official" term or not, but it sounds OK to me. Aha, thanks for the suggestion! :-) Unfortunately, I think the theory section of my ebook might be a little difficult to translate. :-/ Best regards, David. Howdy David!!! I think that study without a teacher is possible, but for people who are at least at an intermediate level. I don't like grammar, but the most imported is to learn a group of words ( phares) and realistic english materials;-) ;-). What is your opinion David?? I think anyone can learn without a teacher at any level! But it certainly requires more motivation and a solid plan to work for beginners. Although, I feel like my ebook is not going to be geared at absolute beginners. For whatever reason I feel more compelled to help the people who have tried to learn a language in a traditional course and then failed. But I'll certainly speak to beginners in it as well. Czekam z niecierpliwością na e-booka. Bardzo chciałbym nauczyć się języka węgierskiego. Myślę, że taka książka będzie bardzo pomocna. Trzymam kciuki! How long will it take You to write this e-book? I'm going to try and write it in two weeks. :-) But we'll see! I started reading through your website and agree with you 100%. As a language teacher, I try to get as much right brain learning in as possible. I am familiar with the TPR method which works well, however, there are two things that are working against me. 1) I am required to follow a book that can take away from spontaneous language learning and 2) 20 to 30 kids in a class makes it difficult for these spontaneous right brain activities. It can be done but there are limitations. There is nothing that kills me more to hear that a person has been in a language class for four years and only remembers the greetings. Well, I am going to be reading more of your material to look for ideas to help me out. Thanks for the blog. George M.
Yeah, having a set curriculum is VERY limiting for teachers and working with so many students means you have "maximize", ie. do what would benefit the most students, essentially leaving off the top and bottom groups. And, of course, if you're working with kids, there are obvious discipline/focus problems with big groups like that. I have the highest respect for teachers who can do good work under those conditions! The world needs teachers like you, George! Usually, though, when talking to learners directly, my advice is to take their learning into their own hands. That's the best way to ensure that they'll get exactly what they need.